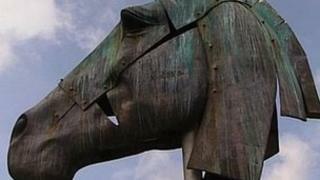 A family have paid about £1m to buy a huge sculpture of a horse's head and transport it from Sussex to Australia. The 30ft (9.1m) high bronze called Artemis was created by artist Nic Fiddian-Green. It formerly stood on the Trundle on the South Downs. Now an Australian family are taking it to Sydney to become a memorial at the grave of their late father. Mr Fiddian-Green said the family had bought his work before and had a love of horses. The sculpture, which was sited at Goodwood House over the summer for the racing festival, is being transported to Southampton Docks before heading to New South Wales. The artist said: "It's going on to one of the oldest mountain ranges in the world - known as The Great Dividing Range - on their family estate as a memorial to their late father. "It's an honour to have been selected and to have made something that will mark something this personal - its something very profound." The four-tonne structure originally stood on the Trundle, near Chichester, looking across the Selsey Peninsula and became a something of a landmark. Mr Fiddian-Green said: "It was a wonderful opportunity, not just for me to have placed it there but for the public to interact with it and encounter something I hope was of interest and inspiration." The sculpture is due to arrive in Sydney at the end of December.